Today is Valentine's Day and I thought I would post a chocolate based recipe. Panna Cotta Cake is smooth and creamy panna cotta layers with soft and fluffy chocolate cake layers. The entire cake is wrapped in a sheet of chocolate. This recipe is deceivingly easy even for the sometimes baker. Panna Cotta is made traditionally that I've seen as a lovely vanilla version. I do love chocolate though. This cake will take some time to make but it's completely worth every minute. Don't let that lengthy ingredient list scare you either. It's mostly basic ingredients you probably have on hand. I do prefer to use a Madagascar Vanilla Paste instead of the bean itself though. The jar can be found at gourmet food stores and it lasts a really long time instead of the essentially one use beans. If you do purchase the beans you can always take the outside (after you use the beans inside) and put them in a jar of granulated sugar and leave them there for a few weeks sealed and you will have vanilla flavored (or at a minimum scented) sugar. You should stir it around a little though maybe once every day or two. Preheat oven to 350°F. Spray two 10-inch-diameter springform pans with 2 1/2-inch-high sides with nonstick spray. Place chocolate and cocoa in medium bowl. Pour hot coffee and hot water over; whisk until smooth. Whisk flour, baking powder, baking soda, and salt in another medium bowl. Using electric mixer, beat oil and both sugars in large bowl 1 minute (mixture will be crumbly). Add eggs 1 at a time, beating to blend after each addition. Beat in sour cream. Mix in half of dry ingredients. Beat in chocolate mixture. Add remaining dry ingredients; beat on low speed just to blend (batter will be thin). Divide batter between pans (layers will be shallow). Bake cakes until tester inserted into centers comes out clean, about 20 minutes. Cool in pans on rack. Place 1/2 cup water in small bowl. Sprinkle gelatin over; let soften 10 minutes. Place both chocolates in large metal bowl. Combine cream, milk, sugar, and vanilla extract in large saucepan. Scrape in seeds from vanilla beans; add beans. Bring to boil, stirring until sugar dissolves; remove from heat. Add gelatin mixture; whisk to dissolve. Pour cream mixture over chocolates in bowl; whisk until completely melted. Place bowl over a larger bowl of ice water. Stir often until mixture thickens like pudding, draining off water and adding more ice to larger bowl as needed, about 30 minutes. Remove from over water. Pour 1/2 of panna cotta over cake in 1 pan (mixture may drip down sides of cake). Freeze 45 minutes. Keep remaining panna cotta at room temperature. Remove pan sides from second cake. Using large metal spatula, carefully slide cake off of pan bottom and place atop panna cotta in cake pan. Pour remaining panna cotta over, filling pan completely. Chill overnight. DO AHEAD: Can be covered and frozen for 2 weeks. Defrost overnight in refrigerator before continuing. Line large baking sheet with foil; set aside. Place another large sheet of foil on work surface; place waxed paper strips atop foil, spacing apart. Stir chocolate in medium bowl set over pan of simmering water until smooth. Pour half of melted chocolate down center of each waxed paper strip. Using small offset spatula, spread chocolate to cover strips evenly, allowing some of chocolate to extend beyond edges of paper strips, making sure strips are completely covered. Using fingertips, lift strips and place on foil-lined sheet. Chill until chocolate just begins to set but is still completely flexible, about 2 minutes. Cut around pan sides to release cake. Remove pan sides from cake. Using fingertips, lift 1 chocolate band from foil. Wrap band around cake, waxed-paper side out, lining up 1 long edge with bottom of cake (band will be higher than cake). Repeat with second band, arranging so ends just meet, pressing band onto uncovered side of cake. If bands overlap, trim any excess paper and chocolate. 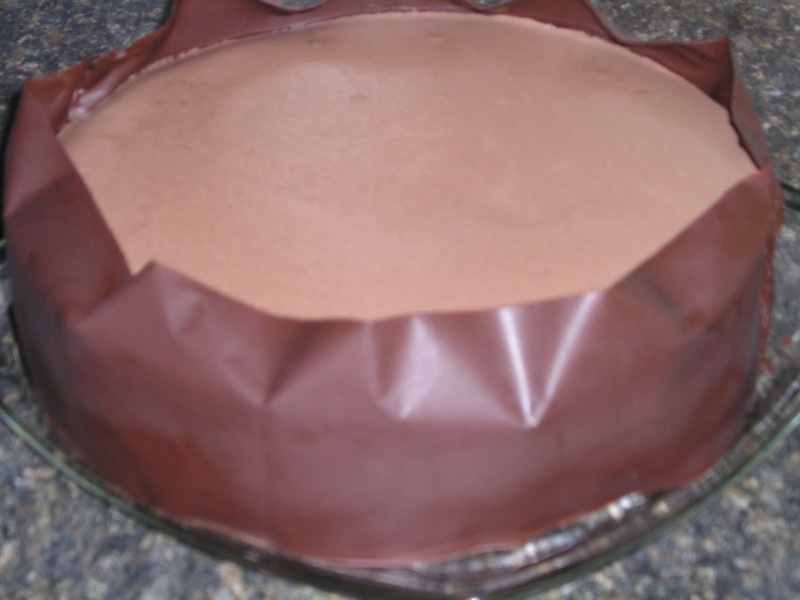 Using fingertips, press top edge of band in toward cake, forming slight ruffle. Chill until chocolate sets, 5 minutes. Gently peel off waxed paper. Chill cake. DO AHEAD: Can be made 1 day ahead. Chill.